If you have missed out on seeing a very interesting locally oriented documentary called “Mullet and Mangroves: The Pioneer Fishing Families of Cayo Costa,” featuring several island residents behind and in front of the camera, tune in to WGCU-TV (PBS – CH 3) on the dates shown at the right. Capt. Robert Johnson is featured in the show, and he gave information about Capt. Peter Nelson and his relationship with Johnson’s grandfather, who is buried on Cayo Costa in the well-known graveyard there. Islanders Jean Woods and Betsy Joiner assisted with background information about the fishing families and where they are today. The portions of the documentary regarding Stanley Darna were filmed at Whidden’s Marina and island resident Effie Joiner’s home, and Effie worked on the piece as a co-producer. 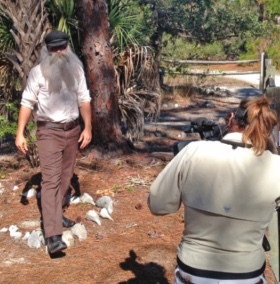 Young Hudson Coleman, a member of a family with generational island ties, is featured in the documentary, as well as Barrier Island Parks Society Executive Director Sharon McKenzie and Park Ranger Robert Long. Thursday, July 12, 8 p.m.
Sunday, July 15, 11:30 a.m.
Saturday, July 21, 3:30 p.m.
Wednesday, July 25, 4 a.m.
Tuesday, July 31, 1 a.m.
Marcy Shortuse is the editor of the Boca Beacon, and has been with the paper since 2007. She is also editor of the Boca Beacon's sister publication, Gasparilla Magazine. She has more than 20 years of experience writing and editing local newspapers and is originally from the Chicago area.